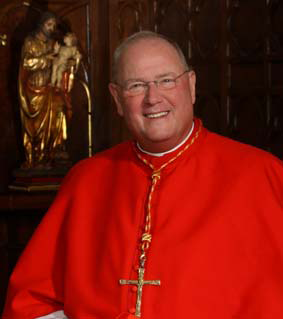 Cardinal Dolan Speech on Accepting the Wilberforce Award: The human project is all about babies! “Not to us, Lord, not to us, but to your name be the glory!” I gratefully accept this prestigious Wilberforce Award, if you agree to certain conditions, okay? We New Yorkers are tough negotiators, as you know, so, listen carefully to these conditions: Ready? So far so good with the conditions . . . ? Condition #2: that this be awarded not to one Timothy Dolan, but to the Catholic bishops of the United States. The gracious people who choose the recipient of this award have already noted that, through this thoughtful event, they wish to affirm “advocacy for life, marriage, the rights of conscience, and religious freedom.” Those principles, of course, are hardly mine alone, but have been a constant platform of my brother bishops. So, I’ll accept this honor, on condition #2, if I can do so on behalf of all the bishops in the United States. Condition #3 . . . I told you I drive a hard bargain . . . is that I can use this occasion to extol the extraordinarily warm friendship and effective alliance that now characterizes the Catholic Church and Evangelicals in this beloved country we hail as our earthly home. No way could a cardinal of the holy Roman Church have received such an honor from such a revered group, made up mostly of Evangelical Christians, in the past! No way! Today, though, thank God, Evangelicals and Catholics are together, co-workers in the vineyard, especially in bringing the light of the Gospel to a culture often in the dark on noble issues such as the defense of innocent, vulnerable life; the protection of marriage as revealed in God’s Word, instilled in reason and Natural Law, antecedent to any Church or government; and the advocacy of our first and most cherished freedom. Actually, I confess a sin to you: plagiarism! We Catholics have stolen your dynamic emphasis on evangelicalism! Blessed John Paul II, Benedict XVI, and our new Holy Father have insisted that a new evangelization is the definition of today’s Catholicism, and George Weigel has posited that only a rediscovered evangelical Catholicism, the title of his new book, can bring about the renewal of the Church longed for by the Second Vatican Council. So, condition #3 is that you’ll shout your Amen to this providential new bond between Catholics and Evangelicals, so evident in our company this enjoyable evening. Alright, these are my conditions . . . take ‘em or leave ‘me. Good! Then I gratefully accept the 2013 William Wilberforce Award! The human project is all about babies! As happy as I am to accept this honor, this is not for me the most joyful event of these past recent months; in fact, you may be startled to hear, neither was the high privilege of participating in the conclave that elected the Archbishop of Buenos Aires as the new Bishop of Rome. My happiest day of late came on Easter Monday, when I went home to baptize my newest grand nephew, Charles Kenneth Grissom. To hold that beautiful month old, seven pound, red-haired boy, even to have him throw-up on me, and to christen him, was a joy. But you know what inspired me even more? To observe the profound change in that baby’s mom and dad, Kelly and Mike. Their whole identify was transformed with the arrival of Charlie, their first born! Oh, now don’t get me wrong: they were two wonderful people, a happily married couple B.C., before Charlie. But, they each had their own professions — Kelly a teacher, Mike a police officer — that devoured their time and energy; they had just bought a little house to which they gave a lot of attention; their time, their schedule, their interests, their future plans, were rather diverse and self-referential . . . no more! What I saw instead was that Kelly and Mike’s attention and interest, their very lives, were now totally absorbed, not in themselves, not even in each other, but in their baby! Charlie dominated their sleep schedule, their plans, their budget, their conversation, their calendar, their future, their dreams. No longer were they living for themselves but for their baby! And, friends, my point is: that’s precisely how it should be! That’s exactly how God intended it to be! That’s what we call a culture of life! The human project is all about babies! A man and woman are made for babies! Culture is all about babies! Our lives are at their best when centered not upon ourselves but upon babies! Is that not the magic of Christmas? C.S. Lewis remarked that the central event of all time, so pivotal that history itself is dated as before or after, was the birth of a baby. Now . . . and here’s my punch line . . . culture is simply humanity’s best effort to protect the baby, the mother, the father; culture’s purpose is to embrace, nurture, protect the baby, the mom, the dad, and to see that this precious infant has the embrace of a community to grow “in age and wisdom” until — guess what? — that baby is an adult, can tenderly and faithfully love a spouse, then have his/her own baby, and the sacred cycle begins again. Can we not even claim that culture is our attempt to “extend the womb,” as babies and children are welcomed, protected, cherished, formed and educated with our highest values, so that they eventually then have their own babies? My apprehension, folks, is that such a culture is in jeopardy! See, a culture that claims the right to redefine the very nature of the relationship that procreates the baby — marriage; a culture that puts the right to a government-subsidized chemical contraceptive ahead of the right to life of the innocent, fragile baby in the womb; a culture that places conception, pregnancy, and childbirth under the domain of the “Center for Disease Control”; a culture tempted to consider a baby an accessory needed for satisfaction; a culture that considers a baby a choice based upon convenience or desire to complete our own lifestyle, a choice rather than a gift; a culture that sometimes depends upon laboratory engineering unchecked by ethics to manufacture a baby; a culture that judge’s a mom’s desire to remain at home to raise her child as less than “liberated” or “fulfilling”; a culture that competes with a mom and dad in passing on faith, its convictions, its expression, to their child . . . is not a culture at all. It might be a “brave new world,” but it is sure is not a culture! It will not surprise you that the pleasant anticipation of this evening prompted me to undertake some research on William Wilberforce. Your speaker of nine years ago, Dr. Phil Johnson, remarked that Wilberforces’s grand objective was nothing less than a transformation of culture. To renew and transform a culture by calling it back to its basic role as the protector of the baby, mother, father, and family, is, I propose, very much in the spirit of Wilberforce. I recently had a most enlightening yet sobering visit with a remarkable woman and her five year old son. She had become pregnant with him prior to marriage. The baby’s father encouraged an abortion; she, too, was tempted to concur, especially when the tests showed her baby had Down-Syndrome. She and her boyfriend, after all, had careers and a promising future; they hardly had the financial resources needed to begin a new family. Yet, she told me that she had been raised — and these are her words — in a culture, a family, a religion, a country, where life was sacred, and the right to life inalienable. She kept her baby; she lost her boyfriend; she lost friends, a job, a career. She tells me she would do it all over again. Now, she tells me, she faces disdain — subtle, she admits — but disdain to be sure, from a few state supervisors, teachers, caregivers, clinics — paid by tax-money, her money — who imply that her choice to give birth to this baby with such a disability was selfish, an unjust burden on society, especially when the life of that baby could so easily and legally have been terminated. And the overwhelming majority of devoted people charged to help her care for and educate her special child report more and more cutbacks in the budgets required to do so. That’s sure not culture; a culture of death, yes, to borrow the phrase of Blessed Pope John Paul II, but not a culture of life. That same pontiff used another phrase, the Law of the Gift. This law of the gift is as old as God’s Word; actually, as venerable as rational men and women who, from the start, could innately detect within themselves a spark of the divine. This law of the gift holds that we are at our best, we act most in concert with what our Maker intends, when we give away in love to another what we most prize within ourselves. For us Christians, this law of the gift was most obeyed by Jesus; For all of us, this law of the gift is the battery that energizes the engine of culture; For all of us, this culture has as its core purpose the protective, sustaining embrace of a baby, a mom, a dad, and the growth and formation of that self-willed baby into a selfless adult. And, for any fan of William Wilberforce, the transformation of a culture gone astray from that purpose is a most heroic cause! This entry was posted on Tuesday, June 18th, 2013 at 6:20 pm	and is filed under News & Commentary. You can follow any responses to this entry through the RSS 2.0 feed. You can leave a response, or trackback from your own site.